We were mostly co-sleepers with Madeline. She was sleeping fine in her crib, but when her pulmonologist wanted her to have oxygen at night I was scared that she’d get the cord wrapped around her neck. I was able to sleep with her next to me, her head next to mine. I breathed easier when I could hear her breathe. She didn’t take up a lot of room, but after she died the space she left in our bed was huge. After Annabel was born, she slept on me for the first few weeks, and then in a bassinet next to my side of the bed. But we eventually moved her into the bed with us. We needed her close, we both wanted to be able to touch her and watch her sleep and breathe and be alive. Eventually, though, Annabel grew and became a terrible bed mate. So she moved to her crib, and we all slept so much better. She was big and strong and I didn’t worry about her the way I had when she was little and new. But sometimes….sometimes at night, when my sickness overpowers my medicines, I think about the nights I’d be up late watching Madeline. I miss her so much. Two nights ago I was so terribly sad missing her and Jackie, who has now been gone for six months. And even though Mike and Rigby were both there in the bed with me, it felt empty. I needed my girl. I woke Mike up and asked him to bring Annie in. I needed to snuggle her and feel her warmth and watch her breathe. He brought her in and laid her next to me. She opened her eyes groggily and said, “Hi Mama. I’m in your bed. I’m dreaming about sand castles.” I asked her if I could snuggle her and she said, “Yes please.” She wiggled into me and closed her eyes. I wrapped my arms around her and was finally able to sleep. I miss the warmth of my babies sleeping with me. Now they yell at my snoring. In turn, I yell at my husband. I hate to sleep . I still walk the halls all night. If only they would sleep with me. I would feel more comforted. Heather, I don’t think I’ve ever commented on your blog, but I’ve read it a lot the past few months. It’s my favorite blog. Just wanted to let you know that this post made me cry. I can’t imagine. I can’t believe it’s been 6 months already. I ALWAYS had a HUGE, MASSIVE amount of empathy for you & Mike when it came to your loss of beautiful Maddie and Jackie! But, it wasn’t until 11 days ago that I truly understood the profound sorrow one goes through when they loose someone so close to them. Your text meant the world to both of us….Thank You!!! This post hit me so close to home b/c as of late, I have been really needing my children (ages 9, 13, 15) close too me as well and by the amount they have invaded our bed, I would say it was is a mutal comfort. Maybe with a lot of snugging and loving our hurt will be even a bit better or at least improved enough so we can actually catch our breath on our really difficult days. ((((((((((HUGS)))))))))) I cannot even fathom what you feel when you miss your beautiful Maddie or even Jackie! I’m glad you had Annie to snuggle close. I can’t believe it’s been six months since Jackie passed. I am so glad you asked Mike to bring Annabel to you. I swear, we need them more than they need us sometimes. My son is now 12 but was once a tiny, respiratory compromised preemie. I too slept right next to him for years, even as he grew, became a fitful sleeper and got off the monitors. There are still nights where nothing can put me to sleep but the warmth of his body and the sound of his breathing. I love this post, Heather. Thanks for reminding me that I am not alone. Congrats on being a wonderful mother to all your babies. I totally get the snuggle mode! We havent faced any of the losses you and yours have faced in the last few years but I know how comforting it is to have that little warm body snuggling up to you. Sometimes nothing else will do but your kids wrapping their arms round you. Sadly our little warm body is now not so little, as shes NINE and still creeping in most nights. She even explained how she avoids the creaky floorboards and freezes if she makes a noise. She stops off at both dogs and cuddles them first too! We do this sometimes, too. Our little girl has a heart defect and some days we worry more than others and have an overwhelming sense of fear for her. Those nights I will ask my husband to get our baby and she will sleep with us. The other nights…the video monitor on my nightstand helps. I can always see her and hear her breathing. Aren’t California King beds the biggest beds on the market? I think you guys need one of those. Or maybe a bedroom that is nothing but pillows, floor to ceiling and wall to wall…fluffy pillows with crisp white linens. Sleep in the same room. It would be so comfy. I loved this post today and totally get needing them close sometimes. My kids are almost 13 and 10 and it hasn’t changed for me even though most of the time I do want them in their own rooms of course! Saturday night we were dog sitting for a family friend and both kids asked if we could have a sleepover at their house. So, the thing I knew I was in bed with a big dog and both big kids and I loved it! It just felt so good having my babies close to me. Last night I had a similar feeling as I layed down with my 6 year old daughter. She threw one leg over mine, put her head on my arm, held onto my hand, and instantly fell fast asleep. It was pretty awesome. Sometimes you just need that. While the loss of a child is the ultimate in pain and suffering – the LOVE of a child has the same type power to comfort and heal the worst hurts in the depths of our souls. you should do it more often if you have the chance. Now that Mea is big we don’t get snuggles in bed too often. The times that we do, are so special. Reminds me of when she first came home. I hope you can sense the very real love we all feel for your family. There are so many strangers out here in the wide world who send you love vibes every day. Perfectly said, April. This post brought a lump to my throat and a tear to my eye. I feel for you so much and am happy that Annie can help calm your storms. Looking forward to the day we read about Little Boy Spohr joining the snuggle-time. Love and calming, comforting thoughts to you, Heather. I LOVE this post! Brought tears to my eyes….I can’t imagine the loss and pain that you guys have endured. I am so glad you had Annie to snuggle with. There is nothing better than snuggling with your baby! My youngest son who is now 2 was born two months prematurely and after he was home from the hospital we slept with him either in our bed or in a bassinet rite next to our bed forever. Now he is not a very good co-sleeper (he likes to wait till i’m asleep then sneak out of bed to find trouble) but every once in awhile he slows down long enough to snuggle with his mommy. Thanks for sharing!!!! This is wonderful. I love cosleeping. It’s been. Wonderful thing for our whole family. Thanks for sharing! It’s so amazing and beautiful to me how our children can heal us. With just a snuggle. Oh, they are so sweet and precious and such a gift!! I’m so glad you have your snuggle bunny Annie to love on you so much. Annie is such an amazing gift. Gosh I just love her. is that weird for an anonymous reader to say? her videos and pictures crack me up and brighten my day. she’s such a sweetie. I also LOVE seeing pictures of both Jackie and maddie and hearing stories about them; they also brighten my day. i will always love hearing about them and seeing their pictures, and i will remember them. Wish mine would snuggle. She’s been trying to get into our bed at night, but all she does once there is punch and kick me in her sleep to achieve maximum personal space, and even managed to make fall off my own bed, so I had to recently recognize that it isn’t mom she wants at night, just out of her crib. We’re moving her to a twin this week and see if it isn’t that she’s just outgrowing her crib. I read your post and last night had the same fitfull sleep I’ve been having since last July. My grandchildren moved 7000 kms away. When we had sleep overs, which was every weekend, when they lived close, my 5 year old granddaughter and my 6 year old grandson slept with me. Last night I missed them so badly I cried most of the night. I just wanted to feel the warmth of them. Today we skyped and my beautiful grandson said, “Nan, last night I woke up and cried because I missed you so much.” He is coming for a month long visit in the summer and his little sister is coming next summer. No matter how old we get, we still need the smell of their sweet breath and the warmth and comfort of their bodies and most of all the love. Thank you for sharing this beautiful post. Thinking of you, Jackie!, Maddie and your families and sending extra hope and hugs. I have so much trouble with the nights. Our son, Sawyer, died at night and I am so terrified to find our twins not breathing that I could stare at them all night. Sawyer has been gone 3 years and the twins are now 5. I know that if I am ever to sleep again I can’t watch them breath all night. They are very active sleepers but I would happily snuggle them all night if I could. I’m glad you brought Annie in bed with you to hold close & snuggle with. And I love that she woke up enough to tell you off her dreams and snuggle into you. Sand castles, huh. For some reason that made me think of skies of piks, oranges, and golds…of soft breezes carrying the distant sound of the laughter of those you love most and your favorite scents…sand castles. Perhaps a dreamy message from your heavenly girls. Somehow, I just always see them together, your Maddie & Jackie…holding hands, smiling those big smiles of theirs as they watch over their loved ones with those big, beautiful, pure eyes of theirs. I can see them building sand castles for Annie’s dreams. 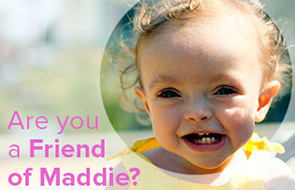 I cannot believe 6 months have gone by since Jackie joined your Maddie. Once more, words cannot express how sorry I am for your lisses. Even though I canot even imagine how you feel, this post made me cry (it’s one of many that do so). I cannot even fathom what losing a child does to you. My thoughts are with you.